Are you looking for best free logistics WordPress Plugins for Transport and Shipping? Then, this article is for you. 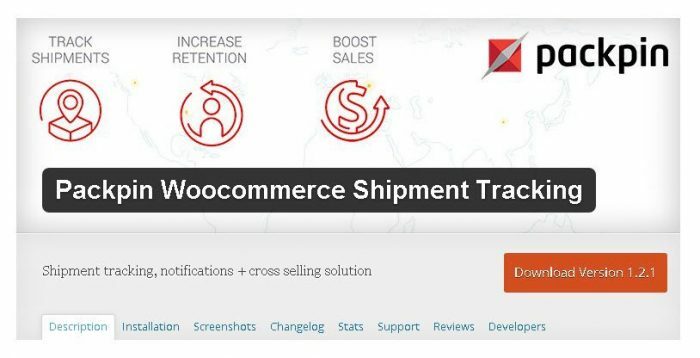 You have already setup a WooCommerce site, that requires WP logistics plugins to simplify your delivery or shipping work such as order tracking, find delivery points or carriers. However, premium plugins take money from your pockets besides that you are also wondering which “Free Logistics WordPress Plugins” are best and necessary for your online store. These inquiries will be covered in my topic today. 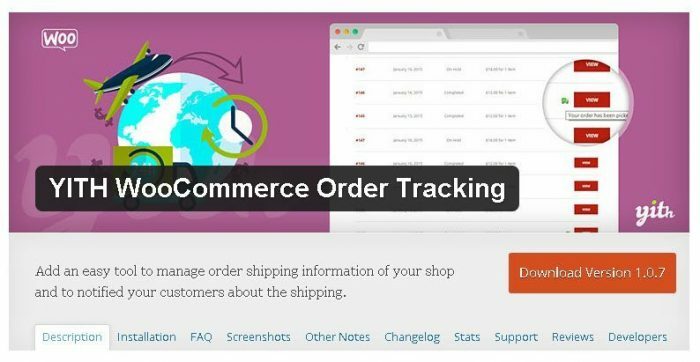 YITH WooCommerce Order Tracking is a WP plugin to help you manage with ease the delivery information of orders and keep clients be informed about the shipping of package which turns your transport logistics work into convenience. The free YITH plugin offers you amazing features: all shipments are forwarded to the default carrier; customize messages in details of your WooCommerce orders; use some placeholders to insert carrier’s details, tracking code and shipping date; select the place in order detail page to show the tracking message to users; manage easily tracking details from the back end; identify shipped & pending orders from the backend. The premium features of this order tracking plugin are also available. Check them out by visiting below link. AfterShip is a plugin to automatically add a tracking number and carrier name to the administration panel, display tracking information for customers to follow the latest status of orders at history page and import tracking numbers to this plugin. With the support of more than 200 well-known international carriers, you can easily select any of them by creating a free AfterShip account. By using delivery points from different carriers: Post Danmark – Pacsoft Online, GLS – YourGLS, SwipBox, Bring – MyBring, Smart Send Logistics WordPress Plugin brings a great module to customers for selecting a delivery point directly from the checkout page. The delivery points are showed by the distance from the shipping information to display the nearest delivery point at the top of the list. Transiz Routes is the perfect selection for a freight/ logistics/ transport company who need to send their customers the quotation for delivering packages, cargos. 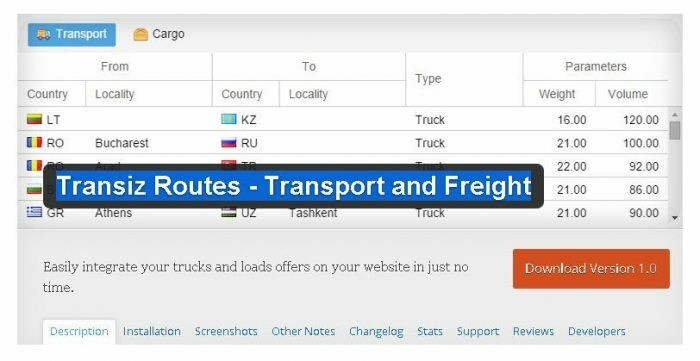 This transport WordPress plugin allows you display the routes posted by a company on the freight exchange site. Another shipment tracking plugin for your logistics work is Packpin which allow customers to follow up the latest status of purchases. For any change in the delivery status, customers will receive email notifications. 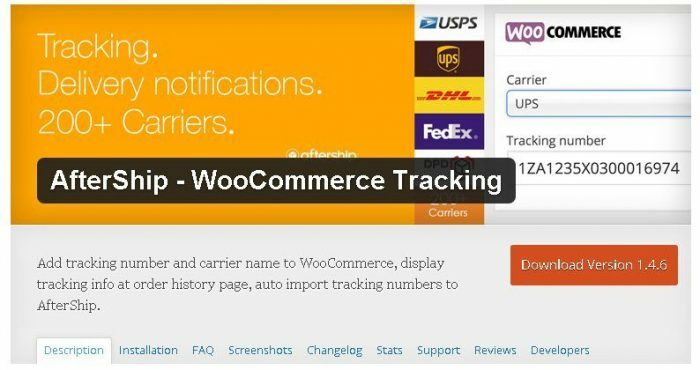 This logistics WordPress plugin supports quick installation, nearly 100 famous carriers, auto tracking of all shipments in one place, auto-detecting your carriers and displaying the results in a user-friendly way, crossing sale possibility on shipment tracking page and tracking button in the customer order. Depending on what shop or business you are running, you can choose one free logistics WordPress plugin or many above for your purpose. These plugins offer you full-rich features, easy to install and set up. The most important thing is they cost you no dollar. Just download them from WordPress.org. Make a try and let me know your opinion. ParcelBroker has just launched a free plugin. It takes your order details and creates a delivery label and updates your customer with the tracking number. We use ParcelForce through it but they have all the others like DHL, UPS, FedEX, TNT etc. Thank for the awesome post. I have a question regarding logistics plugins. I am starting a new delivery company. I will be working with local online shops to take their shipment from their stores to their customers. I want a plug in allow my customers to request a collection for their sales (from my website) and track it. What is the best plugin for my business either free or paid.